Horror accident leaves man with 4feet steel rod impaled from groin to neck, saved by JJ docs inspite of vital organ injury. On Friday the 9th March 2018, a team of surgeons at the Sir J J Group of hospitals, Mumbai undertook a daunting challenge, where they operated and surgically removed a 130cm steel rod which had accidentally impaled 33 year Salim Sheikh. What seemed like just another day at work for 33 year old Mr Sheikh turned out to be the nightmare of his life when around 5pm on Thursday while working on the first floor at a construction site, near Lasalgaon, he slipped and fell 9 feet below. Sheikh fell onto a pile of steel rods, one of which impaled him, entering his scrotum, traversing the entire length of his abdomen and chest to emerge above his right collar bone. His shocked colleagues did not lose their cool. They wisely cut the rod at its base and with the rod still inside Sheikh, they shifted him to Niphad PHC. Niphad PHC promptly administered prelimnary treatment, and Sheikh was immediately referred to Nashik civil hospital. Sheikh was resuscitated and stabilized at Nashik civil hospital. Overwhelmed by the task at hand, the hospital referred him to JJ hospital for further management. Sheikh reached JJ Hospital at 2am on Friday morning. Even the most experienced members of the emergency team were taken aback by the nature of his injury. Then began the process of evaluating his injuries & deciding a surgical plan. 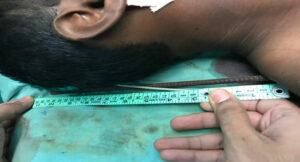 Sheikh was immediately shifted for a CT scan to assess the trajectory of the rod inside his body. However, Sheikh’s vitals started dropping probably due to ongoing internal bleeding secondary to internal organ damage. The emergency team was very prompt to spring into action and start resuscitation. After stabilizing his vital parameters the group of surgeons took Sheikh up for an emergency surgery, where they laparoscopically and thoracoscopically assessed the degree of damage the impaled rod had done to the internal organs. In the abdomen, the rod had pierced through not only the small intestine, but also its mesentry, attachment containing the blood vessels supplying it. Damage was also found at the right side of the colon, finally passing through the liver. After injuring the liver, the rod penetrated the diaphragm, finally entering the chest. It had passed through the lung to finally emerge from the zone 1 of the neck. After the degree of damage was determined, the rod was dislodged under direct vision. Damage to the organs affected was repaired in the same sitting. The surgery lasted for 5 hours, after which the patient spent two days in the ICU. Management of such cases provides a challenge to anesthetists and surgeons as the extent of injury is unknown and there is inadequate time for evaluation and resuscitation of the patient. The anaesthesia team, headed by Dr. Usha Badole skilfully tackled the situation inspite of restricted mobility due to the rod emerging from the neck, performing a single lung ventilation. The team managed the intra-operative course very efficiently. Two teams of surgeons started the procedure simultaneously. Thoracoscopic team comprising of Dr. A.H. Bhandarwar, Dr. Shekhar Jadhav, and Dr. Noaman Shaikh gained access to the chest and very cautiously managed the safe retrieval of the rod from the neck under direct vision. They also repaired the damage to the lung. Laparoscopy team comprising of Dr. S.R. Bhagwat, Dr. Amol N. Wagh, and Dr. Jalbaji more gained access to the abdomen. But in order to ensure safe retrieval of the rod and to avoid concomitant injuries to the surrounding vital organs during retrieval, the procedure was converted to an open laparotomy.They managed to control bleeding from the liver and the mesentery afterwhich, they repaired the damage to abdominal vital organs. Urology team headed by Dr. Venkat Gite and cardiovascular team headed by Dr. K. N. Bhosle were also kept standby for the surgery. 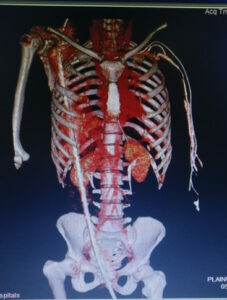 The patient was fortunate enough to have avoided injury to important structures in abdomen like urinary bladder, kidney and inferior vena cava, and the superior vena cava in the chest. The patient was able to survive the accident as it narrowly missed the major vessels. Though an exploration of both chest and abdominal cavities is mandated in such situations, the use of thoracoscopic and laparoscopic procedures for the initial assessment of the trajectory of the rod prevented the patient from undergoing a painful thoracotomy. Currently, the patient has been shifted to general ward. His clinical progress has been satisfactory. The challenges posed by massive impalement could be successfully managed due to rapid pre-hospital transfer and co-ordinated team effort.